Want to Save the World from your Backyard? Hedgerows are nature’s secret little multitool. Our ancestors knew this and learned to use hedgerows to work with the land and craft their ideal landscape. Historical uses of hedgerows range from insanely effective natural fencing to pointed targeted change of air currents. Once you’ve decided to use hedgerows in lieu of more mechanical landscape features, you have officially become a force of nature. It’s like having nature give you a big thumbs up as you change the landscape to meet your needs. Why would you need a hedgerow though? What can hedgerows do for you that grass can’t? Or, straight to it, emergent properties belong to a group of separate parts creating something together which none of them could create on its own. More importantly, there’s a special something to what the parts do as a group. An almost lifelike something, like what happens when a group of cells turn into a human, when the tomatoes tastes like the sun and the soil, when the satellites synchronize with the angular momentum of the Earth. This is when dreams become reality. And this is what we’re looking for when we approach anything in our landscapes. The only way we can mediate our impact on nature is to work with it. Hedgerows hit the magic number in terms of ecological functions ; According to the Jadrniceks who authored The Bio-Integrated Farm, when a single component of the system fills at least 7 functions for the system, the system will produce the emergent property, and become resilient to most disturbances. Hedgerows, at minimum, fulfill 10 ecological functions by default. Hedgerows change air currents - Hedgerows make warm spots cooler, block strong winds, and change the amount of sunlight reaching the soil. They alter the topography the air currents roll over through the landscapes, the same way rocks alter the currents in a flowing stream. On the small scale that means bees and pollinators can move and feed freely from point A to point B with your hedgerow in between. On bigger scales the results are large animal migrations through the Back Forty (which can open up huge income opportunities for hunting permits on private lands and have huge implications for ethical meat sourcing). 5. Pollinator food source for native pollinators. 6. Reliable food and nutrient exchange throughout the food web. 7. Wildlife corridor for critters to get to point B with reduced mortality rates. 8. Introduce new nutrients to the system from migrating animals. Hedgerows play a vital role in nutrient cycling. 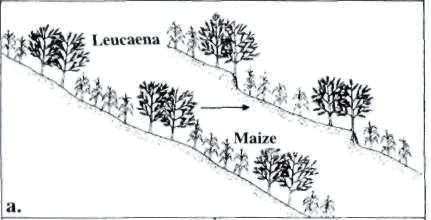 During periods of erosion, a hedgerow located down slope will act as a soil catchment basin, and will deposit the otherwise “lost” nutrients into their roots and shoots for further ecological use. Over time the hedgerow catchment basin will change the entire topography, eventually turning slopes into terraces. Images credited to Wolde, Agroforestry. When on a slope, hedgerows act as a filter strip for incoming and outgoing water, helping to keep streams clean and salmon safe. Certain plants bioremediate the soil by uptaking soil toxins, and can later be harvest and sent in as “ore”. These are just the benefits to nature that come along with having a hedgerow, mostly regardless of what you want the hedgerow to do. Now what you get from the hedgerow will vary depending on your priorities. What are you looking for in a hedgerow? Do you need a natural fence for your animals, or marked out property lines? Do you want to harvest from your hedgerows, get some plums and mulberries maybe? Maybe you’d like money from the government for your hedgerow, the grants are pretty easy to get. Hedgerows are a powerful tool to affect change in a biological way, and molding nature to work within your lifestyle can be as simple as plugging in cuttings from the trees next door. We at EZBFG and Landscapes believe that there’s a plant for every problem. If you want to know the hedgerow that’s right for you, go ahead and take our Mission Code Name : Hedgerow quiz below and see how nature can help you. So quickly! Do something the future you will thank you for! From all of us hear at EZ BioFriendly Gardens and Landscapes, may the rain clean your lungs, the falling leaves be music to your ears, and the air crisp with fall. Jadrnicek, S., & Jadrnicek, S. (2016). The Bio-Integrated Farm: A Revolutionary Permaculture-Based System Using Greenhouses, Ponds, Compost Piles, Aquaponics, Chickens, and More. White River Junction, VT: Chelsea Green Publishing. Wolde, Z. (n.d.). The Role of Agroforestry in Soil and Water Conservation. Lampart Academic Publishing. What are you looking for in a hedgerow? Hedgerows - The multi-tool for a greener world. I need to control soil erosion or water runoff. I'd like to bring the birds back. I can smell the cars and don't like it. I miss the peace and mind I get from being in nature. My neighbors are really nosy, smelly, and/or loud. I'd like to pick some berries and plums. Maybe if an owl lived near by, I wouldn't have so many rats in my compost? Lots of mosquitoes too, maybe I need a bat house? The deer keep coming into my yard.. I'd like money for my hedgerow please. I'm interested in changing the temperature of my yard. I'd like more sun in winter and less sun in summer. Hedgerows can have a huge impact on your patch of the world, and the world is made up of little patches.